Ahh, the unsung dishwasher drain hose; working tirelessly behind the scenes to carry away the greasy, stinky water in your dishwasher and make your wine goblets and chilled salad forks safe for your puckered lips once more. Such a workhorse, yet so neglected. Shoddy drain hose installation is the cause of many washability complaints in dishwashers. If the dishwasher can’t completely drain the odious water from the basin between wash and fill cycles, then you’re washing your dishes in dirty water and you’ll have food gookus left on them. So grab ‘hold of those two squishy lumps at the base of your spine and come tip toe through the drain hose tulips with me. 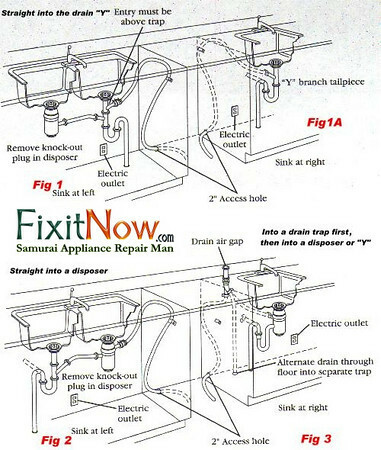 The most important feature of a dishwasher drain hose– and the most often overlooked– is the “riser loop.” Notice in each diagram above that the dishwasher drain hose isn’t run to the drain by the most direct route; nawsir, it’s got what we professionals call a “riser loop” where it gracefully rises up to the underside of the cabinet and then descends to the drain point. “Why do you suppose they do it that way, Samurai?” To keep gooky water from the kitchen sink drain from running into the dishwasher basin. BTW, if you need a new drain hose for your dishwasher, you can get one ratcheer==> Dishwasher Drain Hoses for Most Brands and Models. This entry was posted in Dishwasher Repair on August 2, 2010 by Samurai Appliance Repair Man.